Oklahoma Senate Bill 1001 would prohibit political subdivisions from taxing or otherwise restricting the use or sale of “auxiliary containers” like thin plastic bags used by grocery stores and other retailers across the state and nation, the Oklahoma Grocers Association (OGA) reports. The state Senate passed the measure in March. The bill was authored by state Sen. James Leewright (R-Bristow), who said a tax on bags would hit all Oklahomans in the pocketbook. OGA says allowing towns and counties to set their own tax rates on bags would present a burden, too, to retailers who would have to keep up with different costs of doing business in different towns. The bill also would prohibit local governments from banning or taxing cups, bottles and other kinds of to-go containers. OGA says Leewright’s concerns have been echoed by the Oklahoma Coalition for Uniformity of Commerce. “When everyday products like bags and to-go containers are taxed and regulated inconsistently, it creates costly problems for manufacturers, retailers and working families,” the coalition said in a statement. According to the National Conference of State Legislatures (NCSL), while some states are still investigating recycling as an option, others, like California and Hawaii, are imposing bag bans. In 2009, the District of Columbia adopted a law requiring businesses that sell food or alcohol to charge a nickel for each carryout paper or plastic bag. Additionally, at least 10 cities—from Boston to Boulder to Seattle—have either banned bags or opted to tax them. According to the NCSL, at least 164 bills have been introduced in state legislatures in the last three years addressing the use of plastics by retailers. Though many have proposed bans or fees, others, like Leewright’s measure in Oklahoma, were authored to prevent towns and counties from acting on their own. 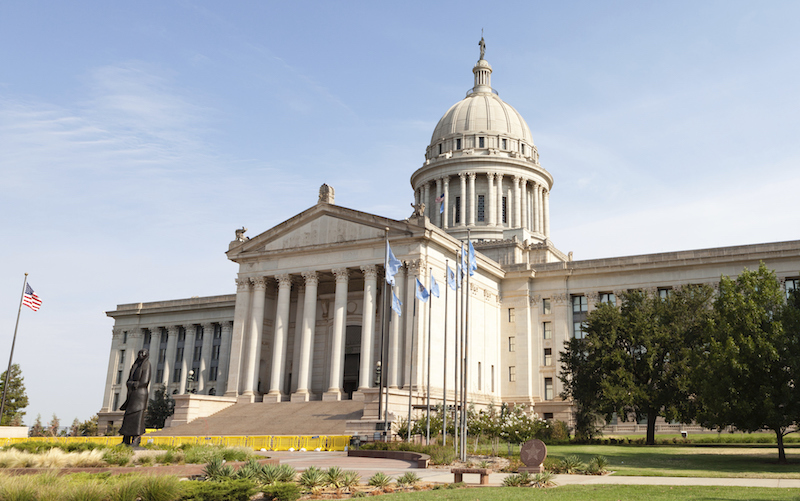 Oklahoma Municipal League Executive Director Mike Fina has called on state lawmakers to either to solve the problem or get out of the way. “They need to not pre-empt cities and let us do what we do best and that is to handle these kinds of issues,” Fina said in a statement.